Another attorney has been added to the staff of the Calcasieu Parish District Attorney's Office. 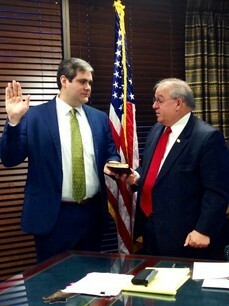 District Attorney John DeRosier recently swore in Jacob Johnson. Johnson is a native of Cameron, Louisiana. After graduating from South Cameron High School, Johnson attended Louisiana State University where he majored in Management and minored in Policital Science. Upon graduation from LSU, Johnson attended Southern University Law Center. He was licensed as an attorney in October of 2011. Prior to joining the District Attorney's Office, Johnson held two clerking positions, one to the Honorable Alex "Brick" Wall of Baton Rouge City Court and the other to the Honorable Penelope Q. Richard of Louisiana's 38th Judicial District Court. He also handled complex civil litigation as a solo practitioner. Johnson is married to Ashley Johnson and is active in our community. He will serve as a Misdemeanor Assistant District Attorney.